Mom works hard all year, so make sure you treat her to an extra special mother’s day treat that’s just for her and will make her feel like a queen, with this decadent superfood — chocolate! The cocoa bean, cultivated in Central and South America, was first brewed into a magical ceremonial drink by the ancient Toltecs, Mayas, and Aztecs. It seems that the Aztecs were the most serious of all the chocoholics — their famed leader, Montezuma II used it as currency and threw back several gallons of his spiced, yet unsweetened, version each week. But now chocolate is hugely popular worldwide and has received some newsworthy buzz, but keep in mind it’s only the 70% cocoa that can qualify this sweet treat as a superfood. Health experts say that cocoa is a top superfood because of the special compounds it contains including antioxidants called flavonoids (that protect against cell damage) and polyphenols that are proven to prevent cardiovascular disease and calm blood vessel functions that may lower high blood pressure. Does your mom have a hankering for designer purses? Well check out this adorable chocolate “designer purse” full of dark chocolate made from single bean Maracaibo, dark chocolate from Venezuela. Enter to win it free!! 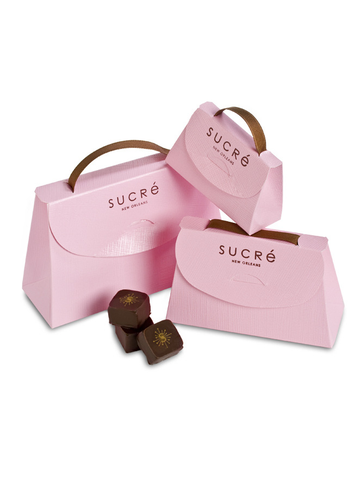 Just tweet or facebook which treat from the Sucre website would tempt you. Then retweet to me (@SkinnyChef) or facebook (https://www.facebook.com/skinnychef) it to me. If you want to make your own dark chocolate basket for mom, here are my favorite 70% dark chocolate bars. Lindt Excellence 70% Cocoa is a full-bodied dark chocolate, perfectly balanced to be neither bitter nor overpowering. Green and Black’s is one of my go-to bars because they use great-tasting, intensely flavorful organic chocolate. Their beans are harvested from the Trinitario and Criollo cocoa pods. Valrhona is my special occasion gourmet pick, and could be the crown jewel in your assortment. Intense flavor, floral notes with an exceptionally long finish, it’s a bar that a foodie mom will adore. Here’s a tempting book on chocolate that any choco-fiend could appreciate. 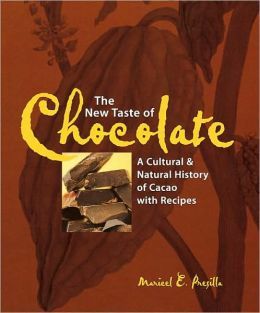 The New Taste of Chocolate: A Cultural and Natural History of Cacao with Recipes by Maricel Presilla. Author Presilla traces the changes in varieties of chocolate products from drinks to chocolate bars and chocolate cakes. She makes us aware of the differences in quality and types of chocolate produced from the different cacao beans and from each region that cultivates cacao in the same way we distinguish between wine regions and grapes. Add a hint of chocolate to her next tea time with Mayan Cocoa Spice tea. They’ve made a delightful combination of Organic cocoa shells, with warming and invigorating spices of organic cardamom, clove and cinnamon Bark.